Keep this crochet hand towel handy in the kitchen when you hang it near your sink! You may have crafted crochet dishcloths before, but you can also make absorbent towels with the same technique! Learn how to work pique stitch with our easy instructions, and you'll have a hanging kitchen towel or two in no time at all. It's a perfect way to learn a new stitch and make something useful. Plus, a handmade towel, paired with a fun dish soap or wooden scrub brush, makes a great gift! Note: Any DK weight-cotton yarn works for this. Because you only need a small amount of the second ball of natural-colored yarn, if you purchase 3 balls, you'll have enough to make two towels. 12 stitches and 14 rows = 4 in / 10 cm worked in the pattern (rows of pique stitch and single crochet). Approximately 10-1/2 in x 18 in (26.5 cm x 46 cm), plus the hanging loop. Before you begin making the towel, you should know how to work pique stitch. This stitch is easy to learn and creates a nice texture. Yarn over and insert the hook into the 3rd ch from the hook or the first stitch of the row. Yarn over and draw up a loop. You should have three loops on the hook. At this point, the stitch is like a double crochet, but the next step is a little different. Yarn over and draw it through two loops. You should have two loops on the hook. Yarn over and insert the hook into the same ch or stitch as you did at the beginning. Draw up a loop. You should have four loops on the hook. Yarn over one more time and draw it through all four loops. You should have one loop on the hook. That completes the first pique stitch. 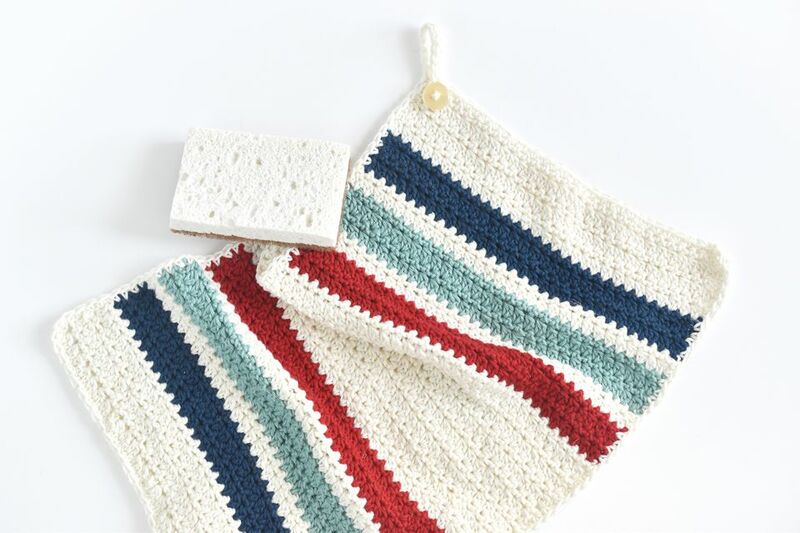 Now it's time to put the pique stitch to use as you crochet a striped hand towel! Ch 32 loosely for a starting chain. Note: If you struggle to make the starting chain loose enough, use a hook that's one size up for the chain. Row 1: starting in the 3rd ch from the hook, work a pique stitch in every ch. (30 sts) ch 1 for a turning chain and turn. Row 2: sc in every st. ch 2 for a turning chain and turn. Row 3: pique st in every st. ch 1 for a turning chain and turn. Row 4: sc in every st. ch 2 for a turning chain and turn. Change to the navy yarn and repeat rows 3 and 4 two times. Change to the natural yarn and repeat rows 3 and 4 one time. Change to the teal yarn and repeat rows 3 and 4 two times. Change to the red yarn and repeat rows 3 and 4 two times. Change to the natural yarn and repeat rows 3 and 4 seven times. Change to the natural yarn and repeat rows 3 and 4 three times. Secure the last st and trim the yarn, leaving a 6-inch tail. ​Weave in all the ends. Attach the natural yarn in the upper left corner and work a border of single crochet around the entire towel. Space the stitches as even as possible on the sides. If you'd rather make the edging more decorative, you can do that instead of this border. When you reach the upper left corner again, ch 16. Sl st in the 5 ch from the hook. This makes the button loop. Sl st in each of the remaining chs as you work back towards the towel. Sl st in the sc at the corner. Secure the last stitch trim the yarn with a 12-inch tail. Weave the tail through the first row or two of the towel and then use it to sew the button in place. Secure the yarn and weave in any remaining ends. Use the hanging loop to attach the towel around an oven or cabinet handle, or simply to hang it on a hook. Cotton yarns become more absorbent as they are washed. You should also expect some shrinkage as you wash and dry the towel. Instead of changing colors, work this towel in a single color with a contrasting border. Make a larger or smaller towel (or even a dishcloth), with more or fewer stitches and rows. You can also change up the stripes, working them all in one color, making fewer or narrower stripes, or crocheting a rainbow!